Calling all vegetable gardeners! This book will become one of your most essential garden tools. Are your tomatoes plagued by blossom end rot? Are your carrots coming up clumpy? 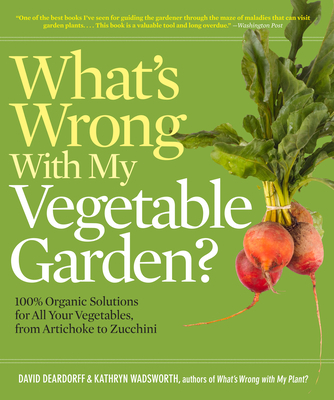 You can find the solution to these problems and many more in What's Wrong with My Vegetable Garden. This useful handbook will first teach you how to garden successfully with plant portraits of popular vegetables including details on growing season, planting techniques, and soil, light, and water requirements. Then, you’ll find details on how to identify specific problems common to each plant and how to combat the problem with 100% organic solutions. David Deardorff is an author and photographer with a PhD in botany and years of experience as a plant pathologist. He taught at University of Hawaii and Washington State University where he served as faculty advisor to the Master Gardener Program. Deardorff has appeared with Kathryn Wadsworth on numerous radio shows including Martha Stewart Living Radio, Growing a Greener World, Real Dirt, and Gardening with Ciscoe. Join them at kathrynanddavid.com, on Twitter at @KBWandDD, or on Facebook at @david.deardorff.108. Kathryn Wadsworth’s skill as an author and naturalist illuminates the connection between gardens and nature. She has led eco-tours to wilderness areas around the world and served as executive editor of research journals. She has appeared with David Deardorff on numerous radio shows including Martha Stewart Living Radio, Growing a Greener World, Real Dirt, and Gardening with Ciscoe. Join them at kathrynanddavid.com, on Twitter at @KBWandDD, or on Facebook at @david.deardorff.108.